This year I germinated two seeds from a cross of R. arkansana X 'Carlin's Rhythm', a tetraploid species X a modern tetraploid shrub descended from the Basye thornless breeding line. Neither of these two seedlings has flowered yet, but both are very attractive compact plants (so far) with the promise of a good growth habit. 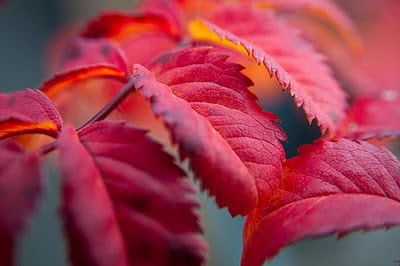 Although I've not seen the blooms yet, I know one thing for sure: I like the Fall foliage color! WOW! Very nice color. It certainly makes up for having to wait to see the flowers. Beautiful, Paul! I've not only found many deciduous seedlings have superior disease resistance, but also amazing autumn colors like this. I love it! Gorgeous. Nice descendent from Kim's rose.